This is a great way to use up all the egg whites left from making hollandaise. Friands are small French muffins. The basic ingredients are ground almonds, butter, egg white & icing sugar. They’re usually flavoured with fruit, chocolate or coconut. They’re a great gluten free bake, just replace plain flour with rice flour. The word friand translates as dainty – something you’ll be far from if these become a daily addition to your breakfast menu. You’ll need a 6 hole silicone muffin tin. 4 egg whites, 70g ground almonds, 110g icing sugar, 75g melted unsalted butter, 50g plain flour, a handful of raspberries. Preheat the oven to 180C Gas Mark 4. Mix together the dry ingredients with the melted butter. In a separate bowl whisk the egg whites to a soft peak. Carefully fold the egg whites into the batter being careful to keep it as airy as possible. Pour the batter into the muffin tin. Press 4 or 5 raspberries into the top of each friend. Bake for 25-30 minutes until the tops bounce back when pressed. Allow to cool for 5 minutes before turning out onto a rack. The high almond content means these little babies store well for a couple of days – if they manage to hang around that long. Ever since I first put Eggs Benedict on the breakfast menu it’s proved to be one of our most popular breakfast choices. Guests love it and I love it too, it’s such a quick dish to prepare and it’s versatile. You can switch the bacon for smoked salmon (Eggs Royale) or use wilted spinach (Eggs Florentine.) You can even add back pudding to make Eggs Hebridean. That’s the pesky-tarians & the vegetarians sorted, just need to come up with a vegan twist. Hollandaise may seem difficult faffing with bain-maries & split sauces but this blender recipe is fool proof and ready in 3 minutes. I’d love to claim it as my own but I think the blessed Saint Delia of Norwich might have been who I swiped it from. Voila perfect hassle free hollandaise. 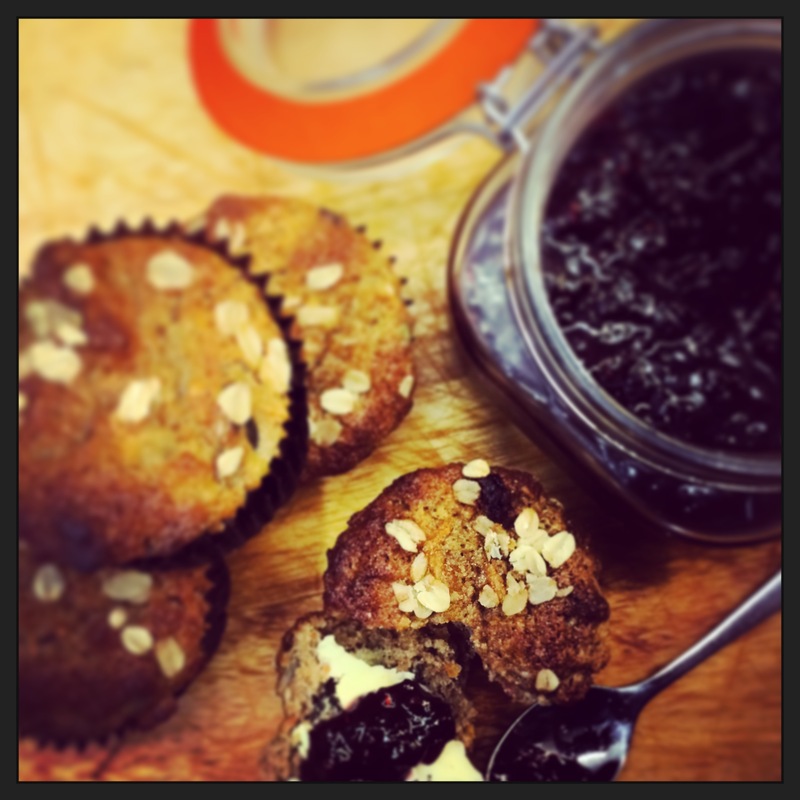 In the next post I’ve a great morning muffin recipe to use up all those egg whites. I’ve always struggled with muffins. Mine always seem a disappointment when compared to the huge, billowy confections that the coffee chains produce. But just read the ingredients & you’ll see these are Franken-bakes, chemically inflated & tasting of factory packing. So I’ve come to terms with my size issues & proudly serve these little beauties for breakfast. I’ve Karen at Hopton House to thank for the recipe, I’ve tweaked it to include a few more ingredients. They’ll keep you fuelled up until lunch time. No chemical enhancements just good stuff. In a bowl mix the melted butter, sugar, mashed banana, carrot, sultana, chopped walnuts, seeds, egg & cinnamon. Add the flour & baking powder & mix roughly. If you over-mix the muffins will become tough. Divide the mixture between the cases, sprinkle oats on top & pop into the oven to bake for 12 minutes. When cooked the tops should bounce back when pressed lightly. Muffins don’t keep well so eat as soon as they’ve cooled slightly.